Store-bought nuts are often expensive and loaded with sodium and sugar so why not make your own candied nuts at home for the holidays? This year why not try making your own spiced nuts for the holidays instead of buying them at the store? Store-bought nuts are often expensive and loaded with sodium and sugar. Instead, you can buy a variety of nuts in bulk and make lots of delicious treats at home. It’s easy to make your own holiday spiced nuts. My Smoky Sweet Spiced Nuts are dipped in healthy egg whites and then coated in a mixture of spices with an irresistible combination of smoky, sweet and spicy flavors. Or try my Maple & Herb Glazed Nuts, which are tossed with sweet maple syrup and fresh rosemary and thyme. Did you know that incorporating a moderate amount of nuts into your diet can be good for your heart? To read more about the health benefits of nuts, CLICK HERE. Happy Holidays! My Smoky Sweet Spiced Nuts are dipped in healthy egg whites and then coated in a mixture of spices with an irresistible combination of smoky, sweet and spicy flavors. Mix the brown sugar, smoked paprika, salt, cinnamon and cayenne pepper together in a medium bowl. Whip the egg whites in another bowl with a whisk until light and frothy. Drop the nuts into the bowl and toss to combine. Remove the nuts, shaking off any excess egg white, and drop them into the bowl with the spice mix. Toss to coat all of the nuts with the spices. 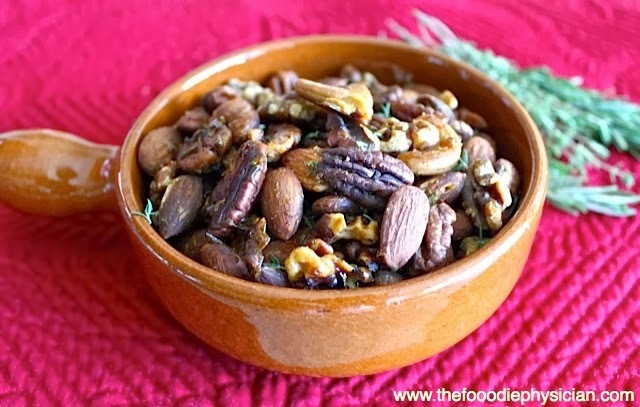 My Maple & Herb Glazed Nuts are tossed with sweet maple syrup and fresh rosemary and thyme. Mix the maple syrup, oil, sugar, rosemary, thyme, salt, and cayenne together in a bowl. Add the nuts and toss all of the ingredients together. Spray a baking sheet with nonstick cooking spray or line the sheet with a non-stick baking mat. Spread the nuts on the sheet in a single layer and bake in the oven for 20-25 minutes, stirring once halfway through. Remove the nuts from the oven and cool them on a wire rack. As they cool, they will crisp up. Serve right away or store in an airtight container for one week. Perfect timing for this recipe, for the Holidays. Thank you for the simple and healthy recipe. Happy Holidays. I love your website! I am trying to get to the recipe for the "Holiday Spiced Nuts" and I clicked "CLICK HERE to read the rest of the post. When I click on "CLICK HERE", it brings me to AOL's website. Can the link be fixed? Sorry about that! I added the recipes to the post so you should be all set. 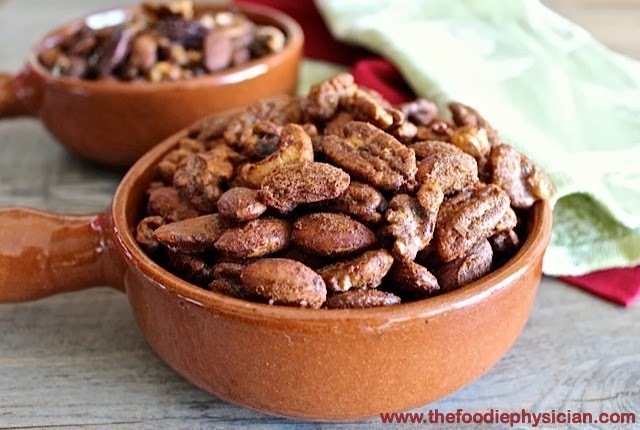 I've also included a link to another post of mine which discusses the health benefits of nuts and includes another 2 recipes. Thanks for visiting!